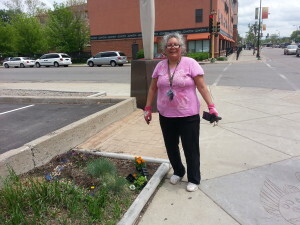 Felicia Wesaw nurtures Sweet Grass near My Relations Gallery, Pow Wow Grounds, and NACDI office for its healing effect on passersby. 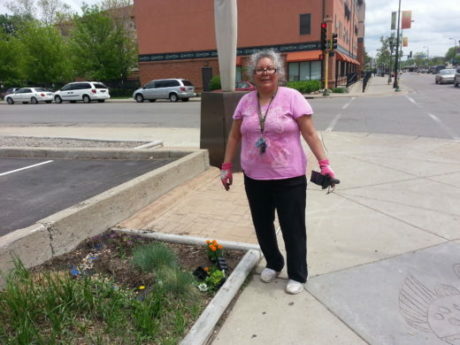 Felicia Wesaw knows that even a small amount of traditional plants can be an antidote to the overwhelming amount of concrete and asphalt in an urban setting like Franklin Avenue. She appreciates the abundance of beautiful murals and their positive effect on the mood of the streets. Her planting and tending to “Sweet Grass” is a small patch put a powerful aura that people have mentioned to her has a healing effect on an often troubled world and perplexed people.